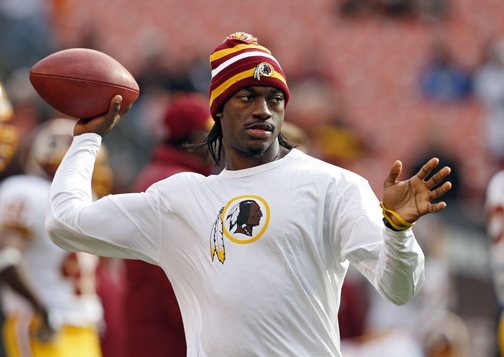 Robert Griffin III’s knee is still feeling fine. His ability to turn a room upside down is better than ever. The Washington Redskins quarterback made an appearance - and quite an impact - Wednesday at a luncheon for the American Cancer Society. He raised $33,000 in a matter of minutes, more than half of the $60,000 tallied during the auction portion of the fundraiser. The crowning moment came when a man from Texas paid $15,000 for a pair of pink cleats worn by Griffin in a game last season. Eighteen people then paid $1,000 each to pose with Griffin for a photograph that the quarterback will sign. He flashed his charismatic smile for each and every flash of the camera. The guest of honor was Tanya Snyder, wife of Redskins owner Dan Snyder. A breast cancer survivor, Tanya Snyder received the society's Mother of the Year award. The Snyders’ 17-year-old daughter Tiffanie gave a moving a tearful tribute to her mother and presented a slide show of intimate family photographs, offering a rare display of the media-shy owner’s personal side. Overall, the event raised some $400,000 for cancer research. Griffin also showed up his playful side, flashing bunny ears behind his fiancee as they posed with Tanya Snyder. And, of course, there was the inevitable football question: How’s the rehab coming along with his surgically reconstructed right knee?